or another, by someone else. While it is easy to forgive a friend for the slight distress we feel over a phone call that was not returned, it is not so easy to forgive those who have harmed us in a major way. The greatest hurt seems to come from those who play the most significant roles in our lives. The enormity of the hurt may lead us to conclude that we can never forgive the other person. To forgive or not to forgive is one of our life choices. It is important for our own emotional well-being to understand that it is a choice, and a choice with consequences. Consider this question – if the harm we have experienced leads us to a life dominated by unresolved anger, a negative image of ourselves, and an inability to trust, are we not allowing the perpetrator to continue to have power over us? When we have sleepless nights cycling and recycling thoughts about old hurts, when we seethe with anger, when we ask questions repetitively that seem to have no answers, we continue to suffer the consequences of being hurt. Perhaps our goal should be to find a way to free ourselves from the damage and to reclaim our lives for ourselves. There are many ways of being hurt. Some are minor and some are more severe. In some cases we are the unwitting victim of those who hurt us. At other times we collude in allowing ourselves to suffer by building expectations that make us vulnerable or placing our trust in the wrong places. Whatever the nature of the damage done to us, it is a potential source of learning. We can allow the hurt to keep us down as we continue to play the role of the victim – or, alternatively, we can learn to overcome it, adapt to it, try to make sure that it never happens again, and, if it does occur again, learn to deal with it more effectively. Unmet expectations. We are disappointed when we build expectations that are dashed. We don’t always get what we want, and this is to be expected. When we build our hopes on achieving a major goal, however, like not getting the promotion we had hoped for or losing the love we had so longed for, the result can be catastrophic. The hurt can be enormous. Humiliation. When we are ridiculed by others – especially during childhood, as often happens when children are called derisive names – or when our pride is wounded, as might happen when a supervisor at work berates us in front of others, the assault on our dignity may impel us to hide, put up impenetrable walls, and vow never to be hurt again. Rejection. When we are rejected or abandoned, we experience loss – but perhaps more important is the fact that we hear the message that we are not good enough. We have to deal with grieving the loss of an important emotional bond – and our self-image is assaulted as well. The fear of abandonment is a powerful force in the lives of many people. This fear can have a strong impact on the way they relate to the world and other people. Deception. Some people may manipulate or lie to us, using us to further their own goals. This occurs, for example, when we are asked to keep “family secrets” or to deny real problems. Not only do we learn to distrust others, but we might also come to distrust our own judgment for falling prey to the deceptions of other people. This harms our ability to trust, and our self-esteem as well. Abuse. We hear about abuse frequently in the media these days. Abuse comes in many forms – physical, emotional, sexual, or through neglect – and it can happen in childhood or in an adult relationship. Many people who suffered from abuse during their childhoods go straight into an abusive adult relationship. The consequences are enormous for the victim. We feel low, unable to share with others, and suspect that others must somehow know about our horrible secrets. We are left with a sense of powerlessness and a legacy of guilt and shame. Forgiving the one who caused us harm may seem like the last thing we would want to do. After all, by not forgiving, we can hold onto the belief that we have some power over the perpetrator and that we can therefore prevent the harm from ever happening to us again. Or we may be so invested in playing the role of victim that to forgive would mean giving up a large part of how we define ourselves. We may feel that evil should never be forgiven. An important point to keep in mind, however, is that when we forgive, we are doing it for ourselves, not for the other person. Forgiving is one way of letting go of old baggage so that we can move on with our lives. Forgiveness does not change the past – but it does change what we can have in the future. There are no deadlines for choosing the option of forgiveness. Forgiving is a highly personal act, and it will not happen until we are ready to let go of the old hurt and move on in our lives with a sense of personal empowerment. Premature forgiveness is not really forgiveness at all. We must prepare for it, and this requires a deep look into our lives. Above all, it is a choice – and some people may choose not to forgive at all. This is a perfectly valid personal decision in certain situations. Forgiveness is not a way of forgetting the past. Indeed, if we have been harmed, we should not forget it. We can learn from the past about how to avoid being harmed in the future. Nor is forgiveness a way of exonerating the perpetrator. We recognize that the harm did happen, that the other person is responsible for this and must come to terms with their own guilt. We are not trying to minimize the harm or claim that the behavior was acceptable. When we forgive, we are not sacrificing anything or giving up our sense of self-worth. Indeed, we are doing just the opposite – by taking a stand that says that we are strong and finally free of playing the role of victim. Forgiveness is a way of declaring our integrity. Forgiveness is a way of saying, “It’s time for healing. The pain of the past should now be put behind me.” Thus, forgiving is a way to express self-assertion and positive self-esteem. To forgive is to declare that our identity is centered around far more than the intense feelings that come from the past. It means that we have better things to do in life than continuing to live under the influence of the one who has caused us pain. Forgiveness implies that we no longer need to hold grudges – we no longer need self-pity or hatred, and we declare our independence from victimhood. Forgiveness signifies breaking the cycle of pain and abuse, giving up the belief that the other person should hurt as much as we do. It means abandoning the myth that if we hurt the other person, it will make us feel better. To forgive implies giving up the unrealistic hope that an apology will have the same meaning to the perpetrator as it has for us. It tells us that we are moving our energy from the negative to the positive. Understand fully that forgiveness does not mean that it is all right for the aggressive behavior to ever be repeated. Forgiveness is meant for past behavior that was unacceptable. Give up the unrealistic hope that the perpetrator will apologize, answer your questions or be able to explain why he or she hurt you. Even if apologies or answers were forthcoming, they would not alleviate the pain. The perpetrator’s views, and depth of insight, will differ from your own. Understand that the pain is all yours, not the other person’s. When we forgive, it is for the purpose of dealing with our own pain. See if there were any positives about the relationship. In some cases there may not be anything positive – but if they do exist, acknowledging them could help you move toward a more compassionate view of the relationship. Create a ritualized separation ceremony which ends the link between you and the perpetrator. For example, you might burn your letter and lists and then scatter the ashes. Or you might visualize a final goodbye where the perpetrator – and your feelings of hurt – will become smaller and smaller and eventually disappear. As part of this ceremony, give the perpetrator your blessing and forgiveness. You are now free to live your life unburdened by the pain of your past hurt. Celebrate that freedom. For Further Reading ~ Simon, Sidney B., and Suzanne Simon. Forgiveness. Warner Books: ISBN 0-446-39259-6. 1990, $12.99. 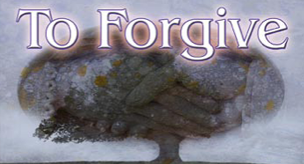 S idney and Suzanne Simon, in their book, Forgiveness, identify several stages in the process of recovery from abuse. Recovering from hurt is a challenging but potentially rewarding life task. 1.) recognizing that the harm has occurred. We may cling to our old “family secrets,” or we may feel that “that was then and this is now.” Denial of the harm prevents us from working on the issues and moving to a place of integrity, where our old hurts are resolved and we can freely make our own life choices. 2.) moving away from self-blame and understanding that we were the victims of someone else’s aggression. We may feel guilty for allowing ourselves to participate in a situation in which we were harmed, but the guilt should not trap us in a cycle of endless self-blame. Accept that someone else harmed us and we did not have the life skills at the time to prevent it. We did the best we could. 3.) understanding the role of the victim. Being hurt leaves emotional marks. We need to develop a good understanding of the ways past hurts continue to influence our lives – how our anger, ability to trust, and self-esteem have been molded as we play the role of victim. 5.) reclaiming our sense of self. We begin the task of finding out who we are, free from the pain of the past. We find out what our strengths are, what we value, what we believe in. We define ourselves as survivors. 6.) claiming our integrity. In the last stage of recovery, we know that we are more than the pain that has been inflicted upon us. And we know that the one who caused us harm is more than the perpetrator of pain. We know that we have the capacity to be moral, compassionate, loving, caring and nurturing – both to ourselves and to others. It is in this last stage that true forgiveness is possible, not for the benefit of the perpetrator, but so that we can live free of our old emotional pain.